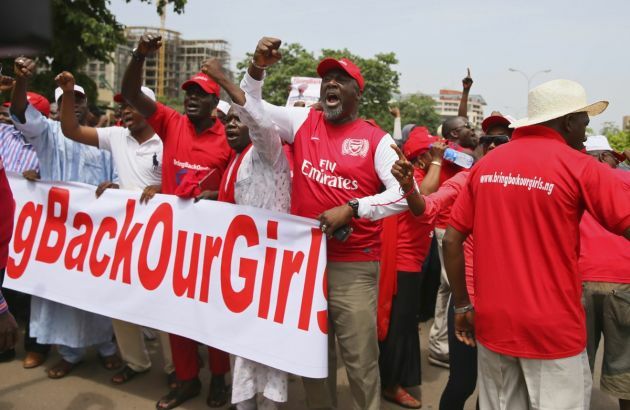 (Photo: REUTERS / Afolabi Sotunde)Protesters of the #BringBackOurGirls campaign group react during a rally, denouncing the Nigerian police's ban on their daily protests, in Abuja June 3, 2014. Nigerian police said on Tuesday that protesters were free to march in the capital Abuja, after an uproar over comments by the police commissioner in which he appeared to ban demonstrations over more than 200 schoolgirls kidnapped by rebels. 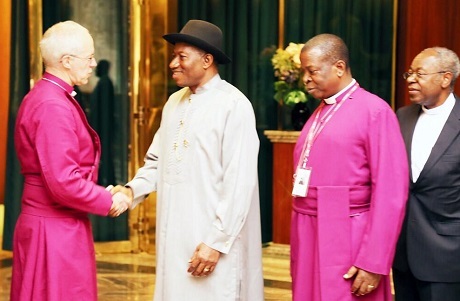 The Archbishop of Canterbury, Justin Welby, has met Nigerian President Goodluck Jonathan in Abuja and prayed with him over the serious security situation in Africa's most populous nation. The Anglican Communion called Welby's trip a "pastoral visit." It said he was there to express "his heartfelt sympathy for the recent events affecting the country, including the recent bombings in Jos and the abduction of more than 200 schoolgirls...missing for almost two months." Many Nigerians are angry that President Jonathan's government has not done enough to try and rescue the girls. Nigeria's population of around 177 million is roughly split between Christians and Muslims. After the Church of England, the Church of Nigeria has second biggest membership in the 80-million strong Anglican Communion counting more than 18 million believers. The archbishop met Jonathan on Wednesday at the presidential villa in the capital Abuja and said he was there to pray and express his condolences over those who were killed by Boko Haram extremists. Boko Haram has claimed responsibility for the abduction of the schoolgirls in the north of Nigeria last month, and said it will sell them into slavery according to a video. "Nigeria is a country which I have profound respect and deep love and like many, I am deeply grieved by what is happening but God is faithful. (Photo: Reuben Nabati / Government of Nigeria)Nigerian President Goodluck Jonathan (C) meets the Archbishop of Canterbury Justin Welby (L) in Abuja on June 5, 2014. Alongside them is Archbishop Nicholas Okoh, the most senior Anglican prelate in Nigeria. The president and bishops prayed together for the security situation in Nigeria. "The country has so much going for it but God is always faithful to us and as Christians, in Jesus Christ we believe in His faithfulness and we can trust Him for the future," said Archbishop Welby. He condemned the activities of extremist fighters in the country and he and Jonathan spoke about recent car bomb attacks in Jos, central Nigeria that was blamed on Boko Haram extremists, killing at least 118 people. "The bombing in Jos was deeply disheartening because I know Jos very well," said Welby who once worked in the city that is seen as marking a symbolic diving line between Nigeria's mainly Christian south and the Muslim north. "I came to pray with His Excellency and express our condolence for the losses. "God is faithful. In one of the letters that Paul wrote to the church, he talked about the sufferings they were going through being known throughout the world. "That is exactly the truth here because the suffering in Nigeria is known throughout the world and people throughout the world pray for the country," said Welby. Boko Haram, whose name loosely translates to "Western Education is Sinful" often targets schools in its efforts to establish a radical Islamic State in northern Nigeria.